Tale's of Michelle: "How Do I Love Thee?" The first stamp I ever bought was "How Do I Love Thee?" by Penny Black from Blossies Scrapbooking in Morayfield almost 10 years ago. I remember coming home with my new stamp, watercolour pencils and spending hours perfecting my colouring with my water colour brush. Now days I use Copics but I still love this stamp. This one stamp lead to a rather large collection of Penny Blacks and a new shelf in the craft room to house them all! I haven't used this stamp in ages and loved colouring him in again. The main paper is from the 6x6 Prima Reflections Collection. 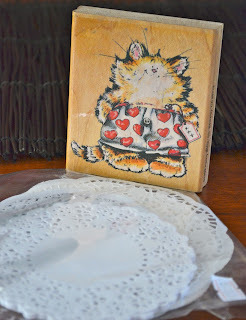 I used a K&Company exposed chipboard tag covered with scrap paper and sanded the edges. The flowers are from my stash - I think I bought them at Arnold's Scrapbooking in Deception Bay. The Rub ons are from Delish Designs and TLC, and of course my doilies, which came from a cheapie shop in Murrumba Downs. I used Copic's E51, E11, E13, E15, R20, RV32, RV35 C1, C3, BV23, R24, R24 and R29 on the Penny Black stamp. 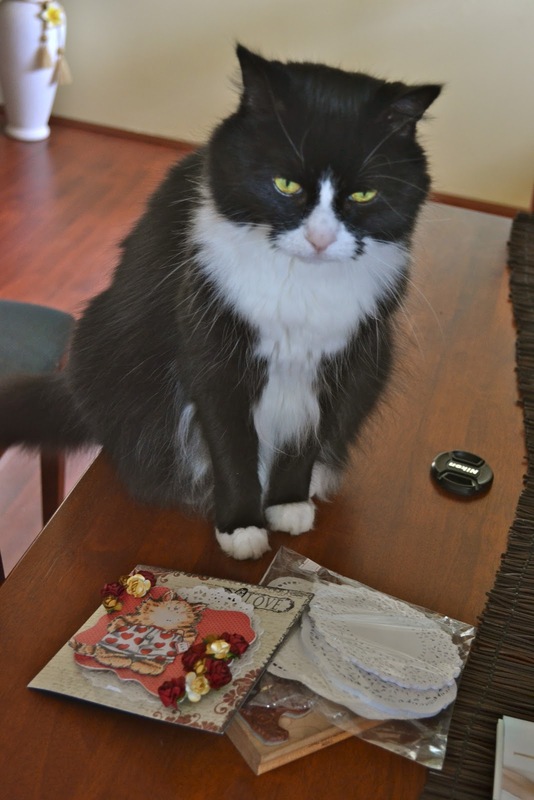 Even Jasmine approves of this creation, either that or she wants me to stop creating and feed her! BRAVO! Congratulations for a great card! I wish you success! Oh so cute and beautifully designed and coloured. A wonderful card! Thanks for joining us at Creative Inspirations Challenge.